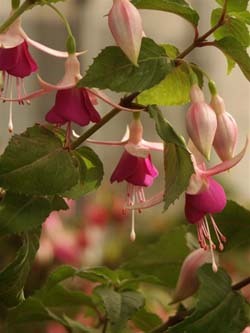 The fuchsias listed in this section have an upright growth habit (otherwise known as bush fuchsias). 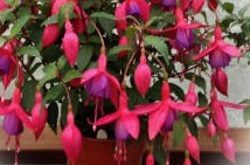 These varieties will need frost protection during the winter months, but make excellent choices for patio pots or summer planting schemes. Very free-flowering, tube and sepals rose, corolla palest pink. Tube and sepals creamy rose, corolla lilac pink. A sturdy plant, tube and sepals waxy white, corolla salmon orange. Medium sized bloom, white tube and sepals with green tips, white corolla. 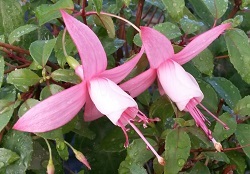 Free flowering variety, whitish pink self-colour, best results obtained in a shady position. Tube and sepals burgundy. Corolla white tinged burgundy with burgundy streaks. Small flowers held horizontally, tube and sepals crimson, corolla mallow purple veined. One of the best striped varieties, tube and sepals cerise, corolla purple striped with pink. Free flowering variety, tube and sepals carmine, corolla orchid blue. Medium sized flower, tube and sepals white with a red reverse, corolla cardinal red shot through with pink. Believed to be the first variety bred with outward facing flowers, tube and sepals waxy ivory white, corolla pale purple. Tube and sepals rose bengal, corolla spectrum violet. Very free flowering, tube and sepals white tipped green and flushed with lavender, corolla lavender violet. 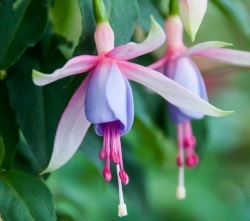 Open bell-shaped flowers, tube and sepals creamy pink, corolla violet. Very strong upward growth make this an ideal choice for a standard, tube and sepals cream fading to pink, corolla currant red. Tube and sepals blush pink, corolla deep lavender. 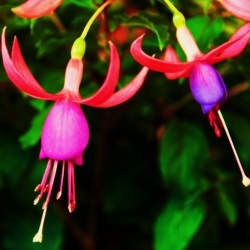 An excellent cultivar for the beginner can be easily trained for standards. Tube long and red, sepals start red and abruptly change to white, corolla deeper red with white base to petals. Medium sized single flower, tube and sepals fleshy pink, corolla violet. Profuse flowering. Tube pink, sepals white flushed pink, corolla lavender blue with pink blush. Very attractive medium-sized flower, tube light pink, sepals waxy white, corolla gentian blue. Large striking flower, tube and sepals creamy white, corolla aster violet. Good strong growing variety, tube and sepals bright red, corolla rich blue with white at base of petals. Aptly named due to the crinkled edges on the corolla petals, tube and sepals flesh pink, corolla coral pink with purple streaks. 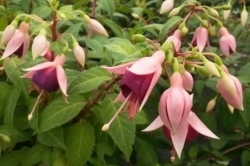 Strong upward growth, ideal for standards, tube and sepals white, corolla rose pink. A sport of Rose Fantasia with light green variegated foliage, tube and sepals pale rose, corolla white rose. Upward facing blooms. Tube white striped pink, sepals and corolla white with pink blush. Small flowers, tube and sepals dark reddish purple, corolla rose pink. Small flower, tube and sepals white, corolla deep lilac. Open growth, tube and sepals cream, corolla white veined with pink. 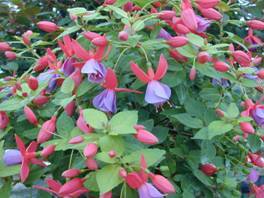 Small compact flowers, naturally self-branching and short jointed. Tube deep rose with candy pink stripes, sepals deep rose, corolla palest pink. Good profuse flowering variety, tube and sepals scarlet, corolla white. Very prolific flowering, tube and sepals dark salmon pink, corolla smoky rose streaked with orange. Free flowering show stopper, tube and sepals ivory pink, corolla red. Strong upward growth, ideal for standards, tube and sepals pinkish red, corolla red streaked with white. Unusual and novel; funnel shaped flowers and leaves carried in whorls, tube and sepals rose tipped with green, corolla light orange. Medium sized flower, tube and sepals white flushed with pink, corolla powder blue. Seedling from Marlies de Keijzer. 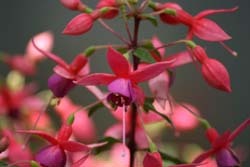 Pinkish red flowers with silvery foliage, same colouring as parent, but flowers considerably larger. Consistent performance, tube and sepals pinkish red, corolla red streaked white. 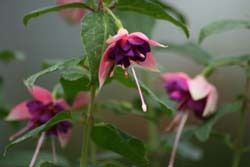 Also known as Black Prince, very striking small flower, tube and sepals crimson, corolla purple black. Small to medium flower, creamy white self-colour, tinged pink on tube. Tube pale pink, sepals dark rose, corolla deep burgundy red. Wide spreading flower, tube and sepals waxy white, corolla splashed purple. Tube white, sepals white with pink undertones, corolla lavender pink with pale pink feathering. Lovely delicate blooms. Small to medium sized flower, tube and sepals creamy white, corolla white veined pink. Very vigorous growth, tube and sepals pale pink with green tips, corolla white. Flowers late in the season, tube cream, sepals pink, corolla deep lilac. Vigorous and free flowering show stopper, tube and sepals brick red, corolla scarlet red. Tube and sepals white, corolla cyclamen purple maturing to cerise. Vigorous growth, tube and sepals apricot cream with green tips, corolla pinkish orange, foliage light green , serrated and crinkled for added interest. Long thin flowers, tube and sepals waxy white, corolla fluorescent orange. Tube dark rose, sepals rose base suffusing to white, tipped green. Corolla pale violet with rose streaks from base. Semi-outward facing saucer shaped flower. Tube and sepals flesh pink, corolla lilac-mauve. 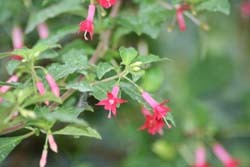 Very small pinkish red flowers with distinctive silvery foliage. Tube and sepals red aubergine, corolla dark aubergine. Light green variegated foliage sport of Annabel, whitish pink self-colour, best results when grown in shade and kept slightly drier than usual. Horizontal china-like blooms, tube and sepals light pink, corolla mallow. Free flowering variety good for standards, tube small and beige, sepals beige brushed rose, corolla dark cyclamen purple. Saucer shaped blooms. Tube red, sepals red tipped green, corolla milky white lightly veined red. Tube and sepals rose, corolla lavender blue. Upward and horizontal facing flowers, tube and sepals crimson, corolla white. 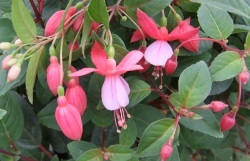 Miniature flowering variety, the flowers are first produced red and fade through pink to finish white. Outward facing flowers, tube and sepals white flushed pink, corolla purple. Upward facing flowers, tube and sepals fleshy orange pink, corolla deeper orange. Self coloured peach bloom, very bushy growth. Long drooping flowers, tube and sepals light salmon, corolla salmon orange. Small resiliant flowers, tube and sepals carmine, corolla rich crimson. Self-branching variety, tube and sepals waxy white, corolla coral pink. Good for tubs, but also a hit in the border. Tube and sepals neyron rose, corolla white with rose veins. Large flower, tube and sepals soft pink, corolla powder pink. Vigorous variety, easy to train, tube and sepals pale pink, corolla white flushed with pink. Vigorous growing variety with upward facing flowers, tube and sepals blush pink, corolla regal purple with a faded centre. Strong upright growth with small flowers produced generously. Tube and sepals rich cardinal red, corolla dark violet purple maturing to rich ruby red. Tube and sepals dark reddish purple, corolla opens very dark purple, maturing to deep red. Striking variety, tube and sepals lavender pink, corolla opens aubergine fading in maturity to deep burgundy as saucer flares fully. Strong upward growth and outward facing flowers, tube and sepals rose, corolla pale rose. 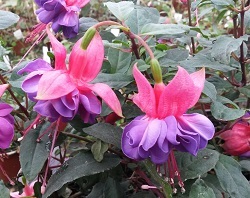 Free-flowering variety with large blooms, tube and sepals crimson red, corolla deep purple. Upright growth and short-jointed, easy to train, tube and sepals pink, corolla white with tinge of pink. Recurving, creamy white tube and sepals, corolla bright magenta pink. Lovely strong grower, tube and sepals candy pink, corolla white. Very free-flowering show stopper, tube and sepals rose, corolla white veined with rose. Tube white, sepals short, white with slight pink tinge at base, corolla white. A self-branching show stopper. Tube greenish white, sepals white flushed with red, corolla dark purple maturing to blue. Tube and sepals rose, corolla pinkish violet. Short branching growth. Small flowers held outwards and upwards, tube and sepals white, corolla pale blue with white centre. Tube cream, sepals orange-pink, corolla magenta. Very vigorous. 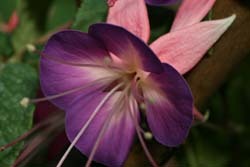 Medium to large flowers, tube and sepals candy pink, corolla royal purple. Free-flowering variety, tube and sepals crimson, corolla pure white. Vigorous growth, tube and sepals pale cerise tipped with green, corolla slightly off-white. Salmon orange corolla, surrounded by white sepals with a slight salmon blush. Deep rose tube, deep pink recurving sepals tipped with green, corolla bluish-lilac. Small, profuse, outward facing flowers, tube and sepals pink, corolla pinkish orange. Small paniculate flowers spreading growth. Tube rose pink, sepals rose pink and recurving. Corolla pinky orange. Tube and sepals red, corolla lavender, short jointed growth. Tube magenta with fully reflexed sepals, corolla mid-pink. Tube and sepals deep pink, corolla white with pink streaking. Tube pale pink, darker at the base. Sepals white flushed pink, corolla white. Striking open flowers, tube and sepals pink, corolla wine shading to violet. Self-branching variety with consistent flowering, tube and sepals pink, corolla lavender blue.